Fruit farmers and The Coca-Cola Company faced different challenges along the mango supply chain in Kenya. But one win-win solution benefited all players. Editor's Note: This article was originally published on Huffington Post as part of Concordia's P3 Impact Series highlighting the work of finalists of the P3 Impact Award. Magdalene Gachungiri examines her mango trees in the off-season. 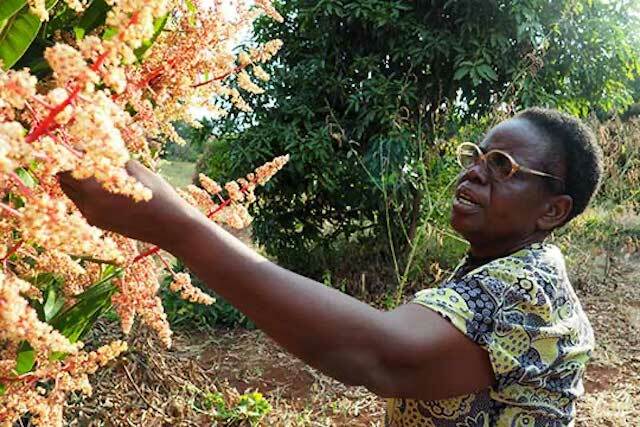 Magdalene Gachungiri constantly struggled to sell mangoes from her small farm. A single caretaker of two children in central Kenya, she didn’t get much high-quality fruit from her trees – and she rarely found a good market even for those. Nearly 200 miles away, in a spacious office building in Nairobi, the supply chain manager for The Coca-Cola Company’s still beverages faced a different problem. Martin Mutura was literally surrounded by the mangoes and passion fruit grown all over East Africa – but had no cost-effective system to obtain enough high-quality fruit for the company’s juices. I was very happy because I realized educating my children would not be hard ever again. A challenge like this called out for the kind of “shared value” solution that we specialize in at TechnoServe, a nonprofit that develops business solutions to poverty. In 2010, we joined Coca-Cola to partner with the Bill & Melinda Gates Foundation, which provided critical funding and technical assistance. The result was Project Nurture, which had the ambitious goal of doubling the average income of 50,000 small-scale mango and passion fruit farmers in Kenya and Uganda by improving their farm management practices and linking them to better markets, including Coca-Cola’s supply chain. We began by training farmers like Magdalene how to irrigate, prune and care for their fruit crops to maximize quality and yields. Their fruit soon improved dramatically, and average yields increased by 21 percent. We then worked with the farmers to create or strengthen over 1,000 producer business groups, which handled bulk sales of the fruit. This gave farmers better bargaining power, better prices, and better access to the finance and agricultural tools they needed to keep improving their crops. It also enabled these groups to train farmers in better crop management techniques long after the project’s end. “I was happy to be a part of the group, for when you’re not in a group you are not able to access good markets,” Magdalene explained. 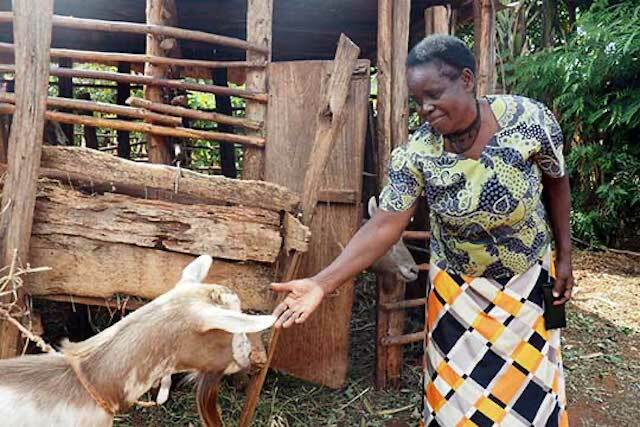 Magdalene with one of the goats she purchased with her Project Nurture income. By the end of the project, the producer groups had established commercial ties with four fruit processors and more than 50 regional traders and exporters, ensuring higher prices for farmers and a faster route to store shelves for the fruit, reducing waste and spoilage. Project Nurture also worked with local fruit processing companies to improve the puree they made from the farmers’ mangoes and passion fruit. As a result, the processors were able to start supplying Coca-Cola for the first time with the puree needed for its juice drinks. When Minute Maid Mango hit the shelves soon afterward, it was Coca-Cola’s first locally-sourced fruit drink in East Africa. And the puree was so good that it was used to make juice in six additional African countries. This opened Coca-Cola’s eyes to a whole new world of local sourcing possibilities. Now through its Source Africa initiative, announced in 2014, the company is working to build sustainable agricultural supply chains across Africa. “Project Nurture was so successful that...what started out as an attempt to manage cost levels for our juice drinks and nectars ended up being an Africa-wide project to source locally,” said Martin. For the farmers of Project Nurture, the impact was arguably even greater. A total of 54,000 farmers – nearly a third of them women – saw their incomes increase by an incredible average of 142 percent.